When a witch is found dead and totally drained Chase Beauchamp the second in command to the Alpha is afraid that there will be more and that it will be his job to find the killer. 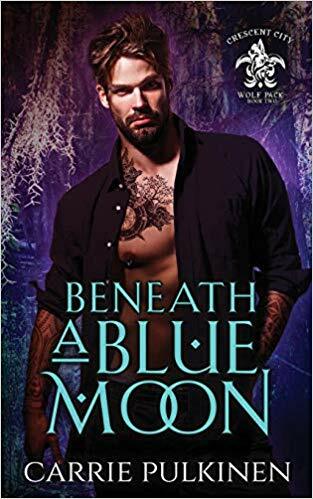 Luke the Alpha of the Crescent City Pack and his mate Macey are planning their lavish wedding and when she can’t make it to a cake testing Luke takes Chase once again putting him in close contact with witches. The bakery is Spellbound Sweets a bakery owned by RainConnolly a witch. Rain is a witch whose has had her powers bound and has lived with a curse for seven years. Any witch that shows kindness to her will suffer, something her sister had first hand information on. Now she owes on her rent and dues to a coven that will not allow her to join because of her curse and if she does’t get the order for the alpha’s wedding she will lose everything. It doesn’t help that Rain is the sort of woman who has no filter between her brain and her mouth and even goes as far as asking how an alpha can marry a man. Rain doesn’t endear herself to Chase who complains about every piece of cake he tastes and Rain can see her losing this order. Outside the bakery Luke knowing about Chase’s distrust and dislike of witches forces his second to take charge of everything cake knowing that each piece of cake was more delicious that the last. Now Chase needs to apologize to Rain and when he does his wolf lets him know in no uncertain terms that Rain is their fate bound the one mean’t for them above all others. It takes the human side of Chase to recognize what his wolf knew immediately that the one he is supposed to spend his life with is a witch. The attraction between Chase and Rain is not one sided because from the moment she saw him she wanted him but her curse could be dangerous to him and his pack. While Chase and Rain try to come to terms with their feelings for each other another witch is drained dry and Rain suspects it is an energy vampire doing the killings. Rain has no idea that the killer is someone who goes back to her past but I will not go into anything more about it. Rain is a character you can’t help love, she is caring and honest and says what she feels but once she reveals her curse and what happened to cause it she might lose Chase. Rain has no idea that they are fate bound and that there is no way that Chase can walk away from her but he knows that there is a killer out there and Rain is in danger. Another wonderful secondary character was Chase’s niece Emma, six years old going on twenty she recognizes immediately that Chase and Rain are in love after all according to her a woman knows these things. This book is filled with romance, suspense, secrets and surprises and I wanted to reveal all but controlled myself because I loved this book and highly recommend it.